Who Would Benefit From Eliminating the Federal Gas Tax? We wrote recently on Streetsblog Capitol Hill about a proposal by Republican members of Congress to eliminate the federal gas tax and turn transportation funding entirely over to the states. This proposal — “devolution,” it’s called — has been a conservative dream for decades. Atlanta’s MARTA would not be possible without federal funding, as Georgia provides no support. Transportation reformers tend to hate the idea because state DOTs on the whole are pretty intensely focused on highway building. One of the goals, as described by the Heritage Foundation, which is playing a leading role in promoting the devolution bill, is to allow states to forgo funding transit altogether. But some urbanists believe there might be a bright side to eliminating federal funding for transportation, since many highway boondoggles pursued at the state and local level are inspired by the promise of federal funds. In Georgia, [bill sponsor Tom] Graves’ home state, the state constitution expressly prohibits the expenditure of gasoline tax revenues on anything other than roads, so without federal money, the Peach State would essentially only invest in highways. That’s actually not a huge change. MARTA, which operates rail, bus, and paratransit in Fulton and DeKalb counties, is the largest transit agency in the country that receives no funding from the state government. 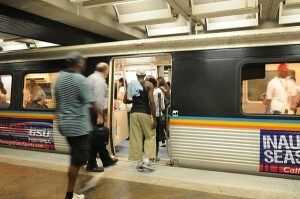 Of course, MARTA was able to build their rail system using local and federal funds. But without the federal share, it would have been impossible. Which is probably what Graves and Lee want. After all, the GOP has long suggested that investing in transit is a wasteful subsidy, while investing in roads is a sound investment for economic development. Of course, this isn’t accurate. According to a Government Accountability Office report from September 2011, both Georgia and Utah are winners in the transportation dollar lottery. Both states got $1.10 back in federal transportation dollars for every $1.00 they sent to Washington between 2005 and 2009. Meanwhile, Yonah Freemark at the Transport Politic thinks states should play a larger role in construction and the federal government should play a larger role in infrastructure maintenance — a reverse of the way it works now. Elsewhere on the Network today: Parksify considers the multifaceted importance of sidewalks as public gathering places. Bike Portland asks if inclusionary zoning is the key to keeping low-car neighborhoods in Portland economically diverse. And Bike Pittsburgh reports local residents are taking to the streets to demonstrate for safer walking conditions.